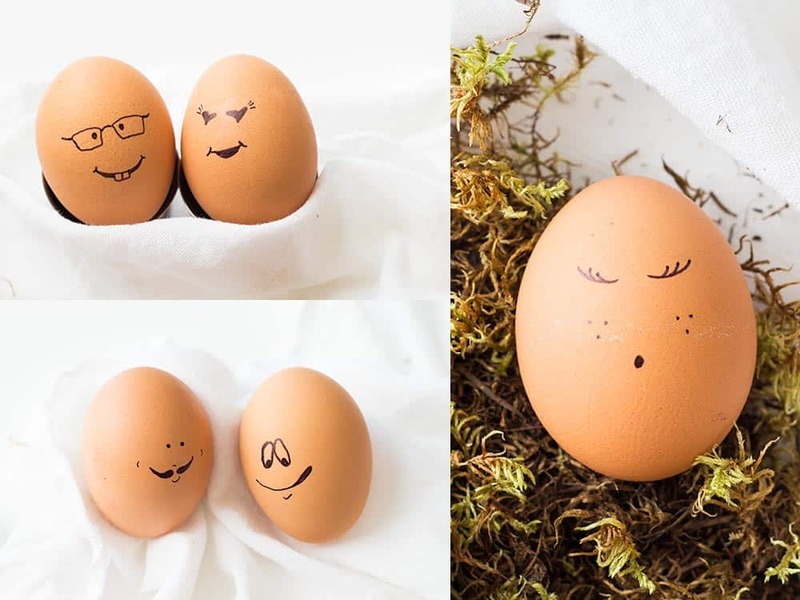 A mess-free, quick, easy and funny way to decorate hard boiled eggs. Decorating Easter Eggs is fun for the kids!! 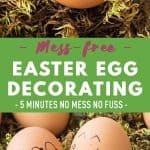 It being mess-free: a blessing for mom! I have a confession to make: I don’t like making a huge mess that I will have to clean up for triple the time it took to make the mess in the first place. I like everything clean but I don’t like cleaning so the only way to have everything kind of clean without having to clean too much is by simply paying attention not to make too huge of a mess in the first place. I saw amazing tutorials on how to use natural dyes made with cabbage and green tea and whatnot but those colors have to be prepared like 24 hours ahead…in short: it felt like it was all too much of a hassle. THEN, I stumbled upon these super cute “egg people”. Simply faces drawn on eggs with a sharpie and I could literally hear an angelical “ahhhh” in my ears. This is it! 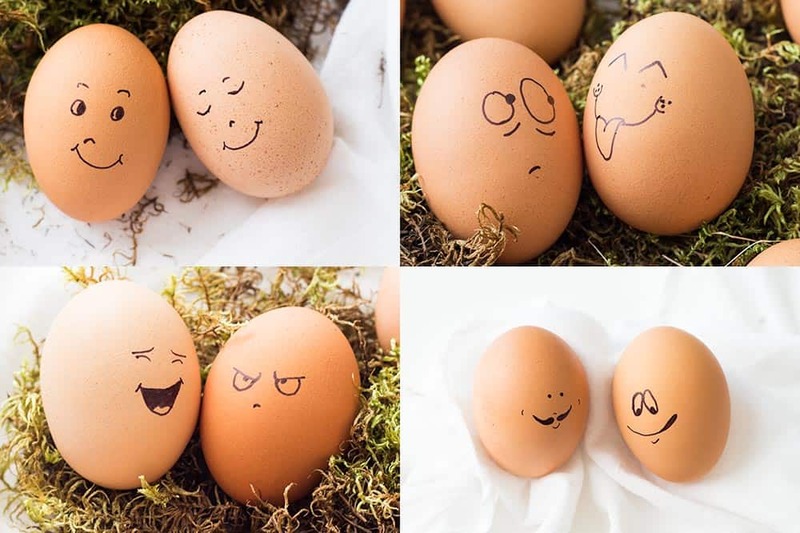 This is THE best way of decorating Easter eggs and the kids will absolutely LOVE it!! By the way, I am like the least talented drawer you have ever met in your life but closely watching other people’s examples was enough to be able to replicate this insane cuteness! There are endless possibilities and I simply searched for “egg people” on Pinterest and started drawing on my hard-boiled eggs. 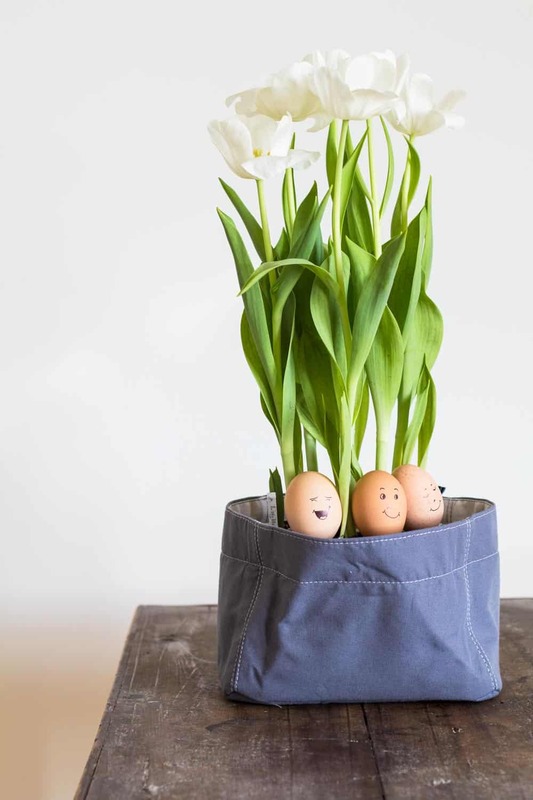 Decorating Easter Eggs doesn’t HAVE to be messy and stressful and time-consuming. It can also be quick, easy, fun and clean….am I hearing yet another angelical “ahhhh” there? When the kids saw this they immediately wanted to choose “them”. My son chose the one sticking out his tongue, my daughter the sleeping egg with freckles. They chose their dad as the one wearing glasses and mommy with hearts in her eyes. I guess I was lucky they didn’t identify me with the angry egg. Phew! Boil about 2 litres of water in a big pot over high heat. Once boiling strongly, carefully place fridge-cold eggs into boiling water with a skimmer. Reduce heat to medium and set a timer for 8 minutes for small eggs and 9 minutes for medium to large eggs and 10 minutes for jumbo eggs. Remove from water and let cool by itself until you can touch it, no ice baths or anything needed. 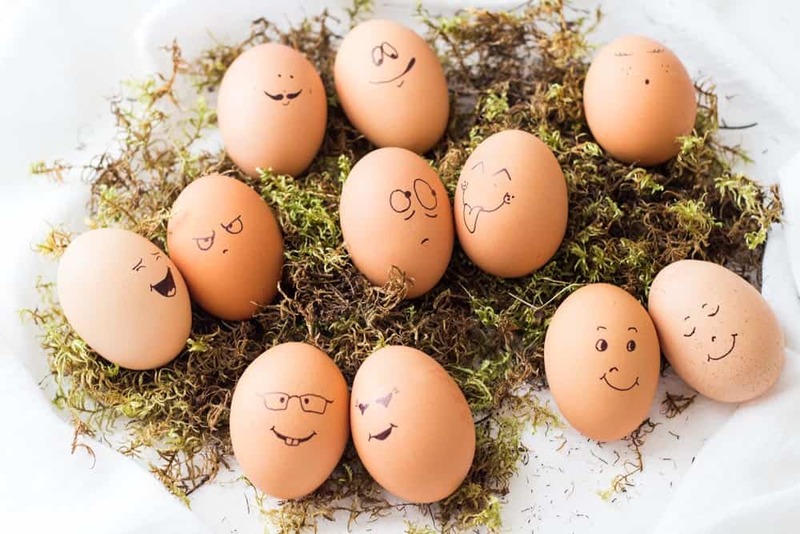 The faces can be drawn on the eggs before or after boiling. Makes no difference. Have a wonderful “clean” start into the week. Cheers! These are so cute! I’ve never thought about just drawing on eggs like this with a pen! It would really cut down on time and mess if you didn’t want the hassle of coloring your eggs. Ha! These are adorable Lorena! Good thinking with the easy clean up Easter eggs. We almost never dye eggs, but will probably start once this little dude is born. Thank you Trish! I never dyed eggs before having kids either. I mean maybe at some point when I was a kid at my Aunts house and at school but not ever since “I” have to do the clean-up. This was easy peasy and had the same effect on the kids I’d say. Win-Win!